Spead mustard on 1/2 of the bread slices. Top with ham and cheese. Complete the sandwich with remaining bread slices. In a shallow pie dish beat together milk and egg white. Dip each sandwich in milk mixture, turning to coat. 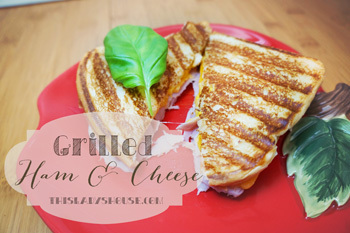 Cook on griddle, skillet, or panini grill until bread is golden brown and cheese is melted. This entry was posted in Recipe and tagged Lunch, Sandwich.